My dogs, Brandy and Duke, are spoiled I know that, but so many dogs are not looked after well, or are homeless, so I shower a little bit more love on my two to make up for it! I can’t have rescue dogs because I have to have non-allergy coated dogs – hair or wool instead of fur. 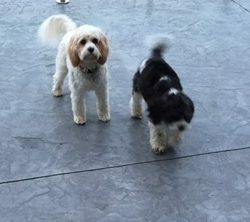 When I chose my breed of dog to buy, I wanted one that was happy to sit while I wrote and I thought what better breed than a Cavoodle – a Cavalier King Charles Spaniel crossed with a Poodle. I write historical romances and smaller King Charles Spaniels were lap dogs to the royalty. 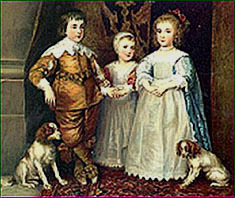 Thought to have originated in the Far East, toy spaniels were first seen in Europe during the 16th century. They were made famous by their association with King Charles II of England (1630–1685) and have been linked with English royalty since the time of Queen Mary I (1516–1558). Members of the breed have been owned by Queen Victoria, Grand Duchess Anastasia Nikolaevna of Russia, and Queen Elizabeth II. Here is a picture of my dogs sleeping on my bed last night, yes they sleep with me. Sometimes I wake up and I have one on each side of me and my arms are pinned under the blankets – they weigh 8 kg each! Yet, when I travel I miss having them on my bed. I sometimes put dogs into my stories, or horses, I love horses too. I also have to keep a throw over my bed’s duvet as it’s winter here and their feet get wet and muddy. 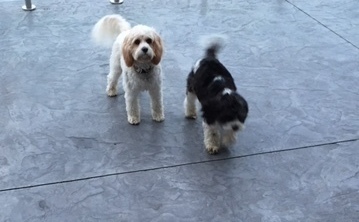 As I’m writing this Brandy, who is the white and tan one in the front of the photo is sitting next to me trying to say that it’s her dinner time. She is more Poodle than Duke and is also very clever. But that means she demands more attention. My little boy Duke is quiet, very well behaved, and a joy to own. Do you have a pet? Any pictures? And what is it about your pet that when you are away from them you miss the most?